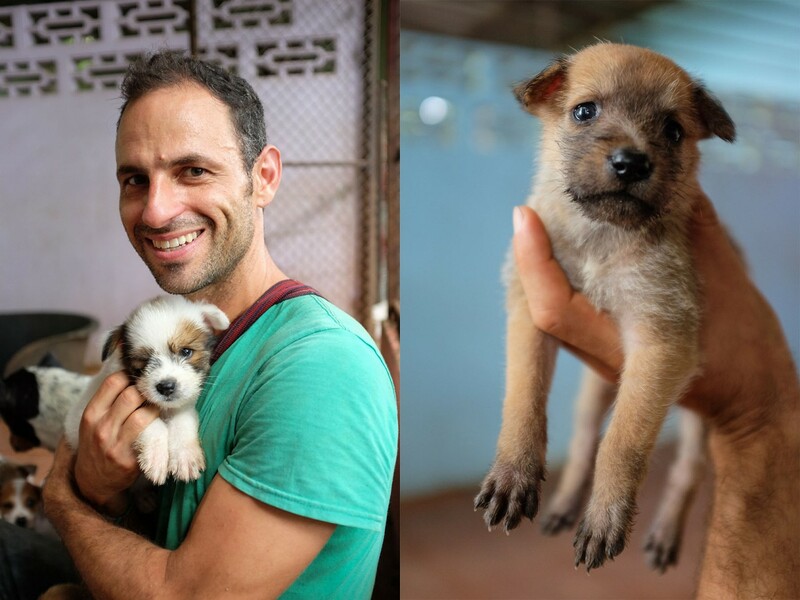 Or how 75 elephants, 470 dogs, 133 monkeys, 4 bears, and one baby water buffalo taught me how to face the world as it is. At times the world can be a brutal and unforgiving place, especially for the defenseless among us. And at times this brutality has crushed my spirit and left me desperate for escape. In these times, it's hard to know how to engage the world, or how to take care of myself. I've struggled with these questions quite a bit recently, as I wrote about in Eating is the Easy Part, but the most recent leg of my journey—spanning 46 days, 2 countries, and 4 animal sanctuaries—dare I say, has given me more answers than questions for a change. 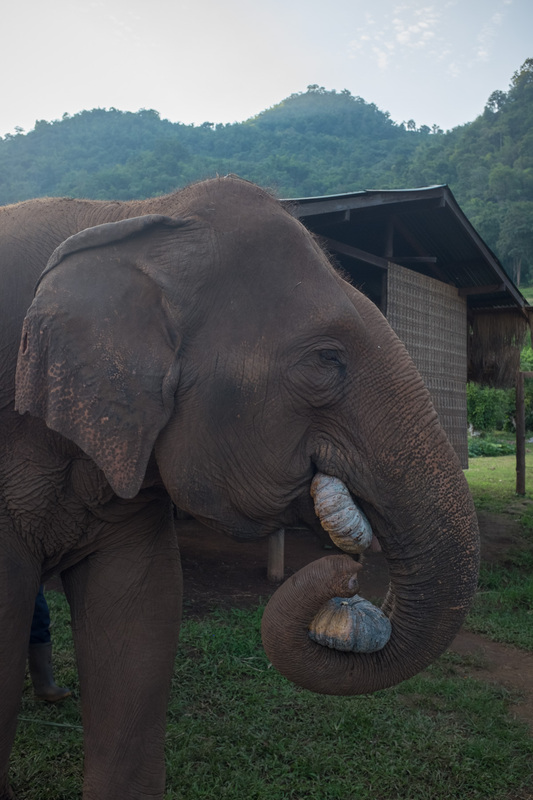 It all started back when this massive adventure was only in its planning stage, and I heard about my friend Terry's experience volunteering with elephants in Thailand. I love elephants as much as the next guy, but in North America the only way to see them is in a circus or a zoo, and I'm not about that. So I was thrilled to find this unique opportunity to interact with one of the most incredible animals on earth, in an ethical way. (There are lots of elephant rides, and similar attractions in SE Asia, but they all involve painful coercion and horrific abuse.) My first glimpse was at the Cambodia Wildlife Sanctuary, a 25,000 acre reserve in the northern part of the country. And I must say, I was not disappointed. It was there where I met my first elephant friend, Arun Reah. 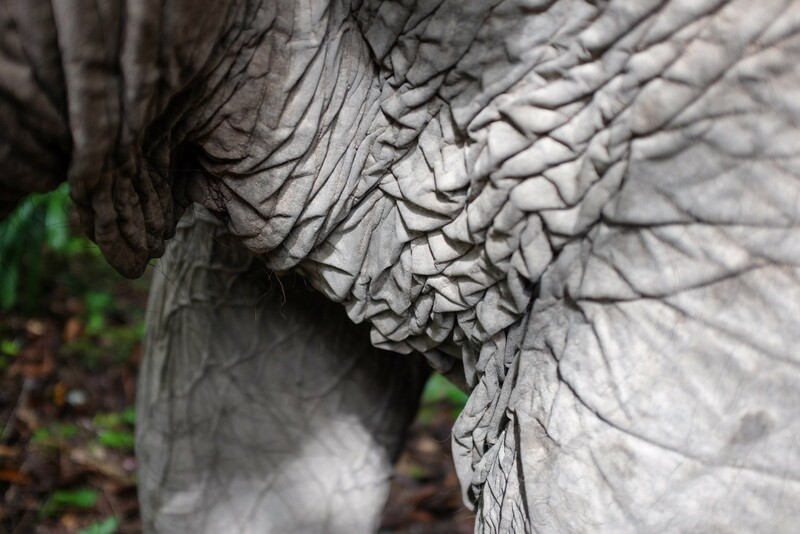 There is something so mysterious about elephants, like they are dinosaurs brought back to life, yet they are extremely intelligent, sensitive, and social, and in those ways are actually really easy to relate to. I was absolutely mesmerized seeing them up close, as you can see below for instance, how the tough yet soft skin of her neck wrinkles and drapes over her body. Another thing that makes them so relatable is that elephants have roughly the same lifespan as humans. Arun Reah was forced to work in the logging industry—chained, prodded, and dragging massive timbers through the jungle—for the first 35 years of her life. 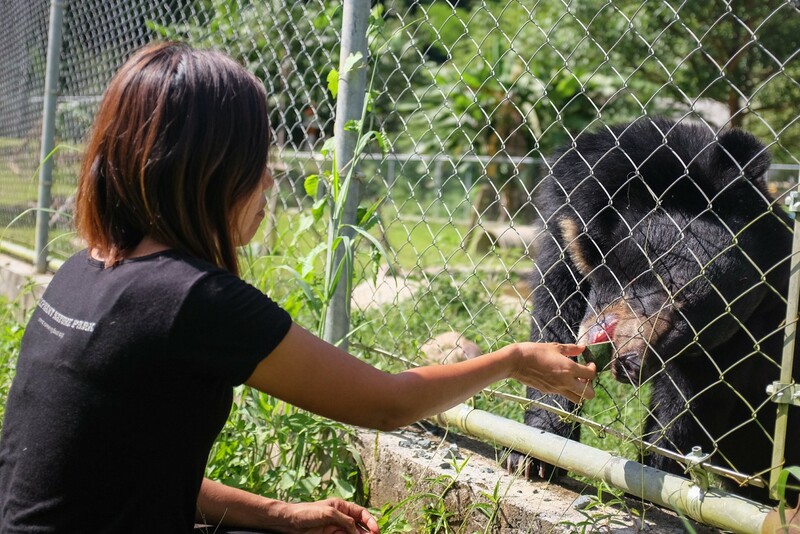 In the last 10, since being rescued, she's been able to live in freedom at the sanctuary, enjoying the simple things in life. Here she is on a jungle walk. No chains. No spikes. No felled trees to drag. Just sugar cane to keep her happy and well fed. To hear the sigh she lets out, upon the first sweet crunch, is pure bliss. 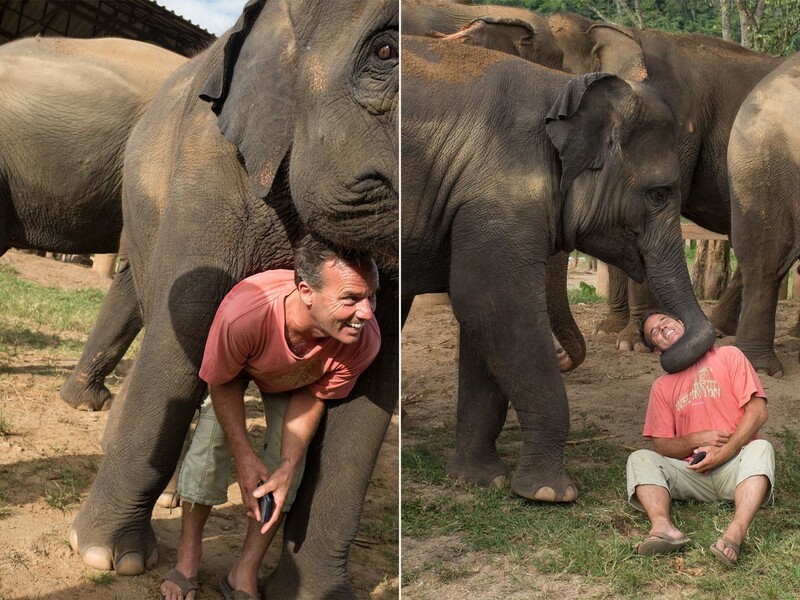 Those who work with the elephants are called "mahoots." 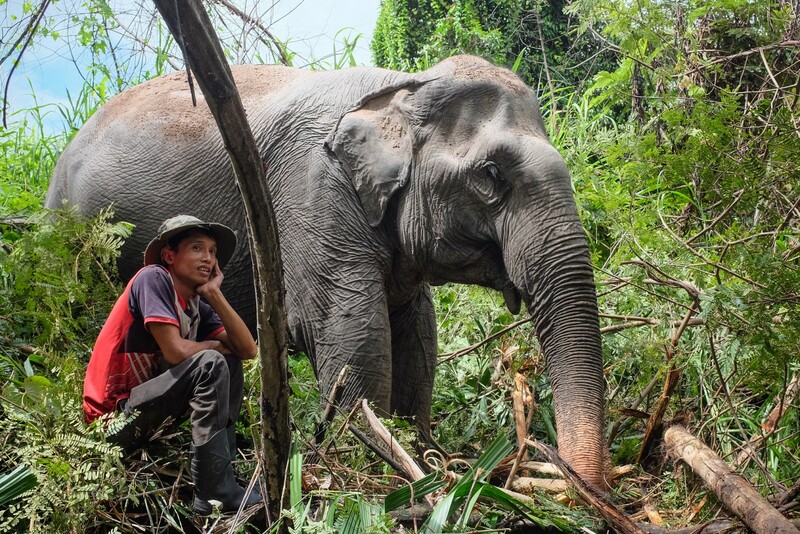 Traditionally they stay with the same elephant their whole lives and get to know them intimately. But traditionally, this relationship is also one of abuse and coercion, separating them from their mothers, employing a gruesome "breaking" process when they are babies, and using pain-complaince techniques to make them perform. At the sanctuary, however, the mahoots' job becomes one of caretaker. I'd like to think everyone is happier this way. 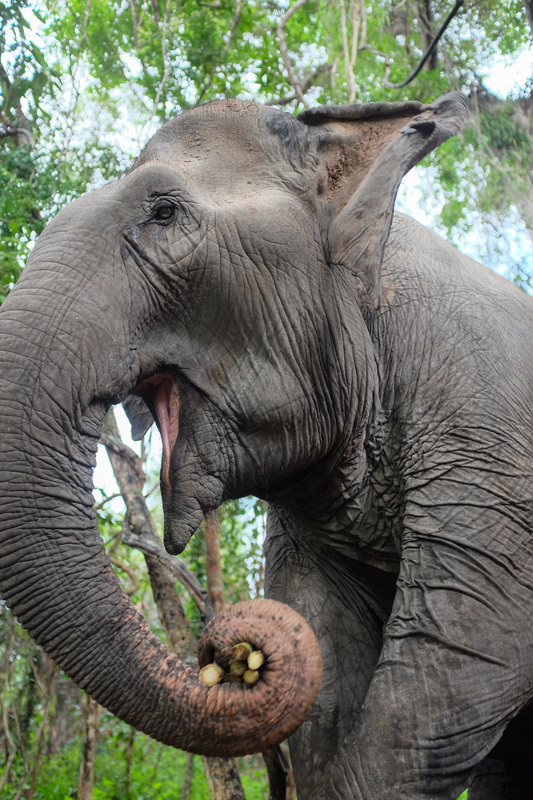 This photo was taken on one of our jungle walks, where she got to find and eat a couple entire palm trees. I met many more of these lovely beasts at Elephant Nature Park in northern Thailand—the most memorable of which has to be little Dok Rak. Only 5 months old, he's one of the few elephants who was actually born at the sanctuary. Unlike his mother, and 65 other elephants there, he will never know anything but love, freedom, and family. 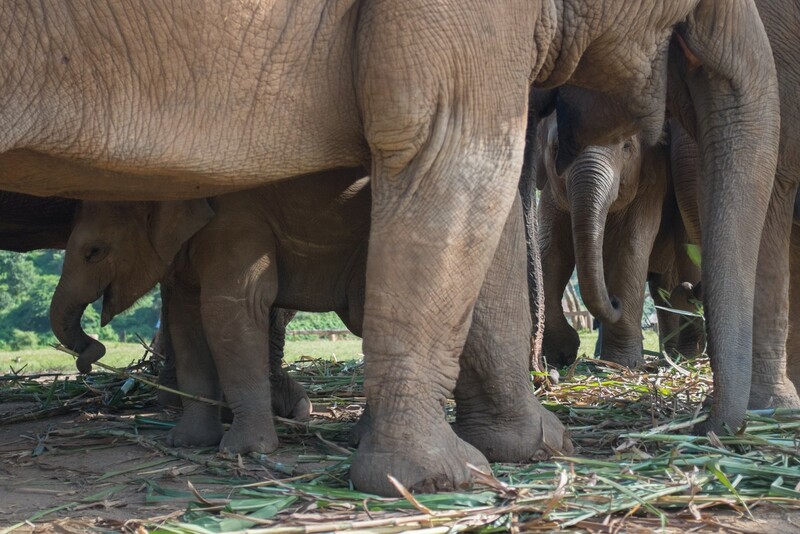 When a baby comes into the herd, they are taken care of by their mother, but a handful of "nannies" also volunteer to be primary, life-long caretakers. They will often surround the babies to protect them from any outside threats. The dog shelter is run by a handful of superhero staff, and a rotating group of about 10 volunteers. Lucie and Jack decided to stick around for a few months to help out. 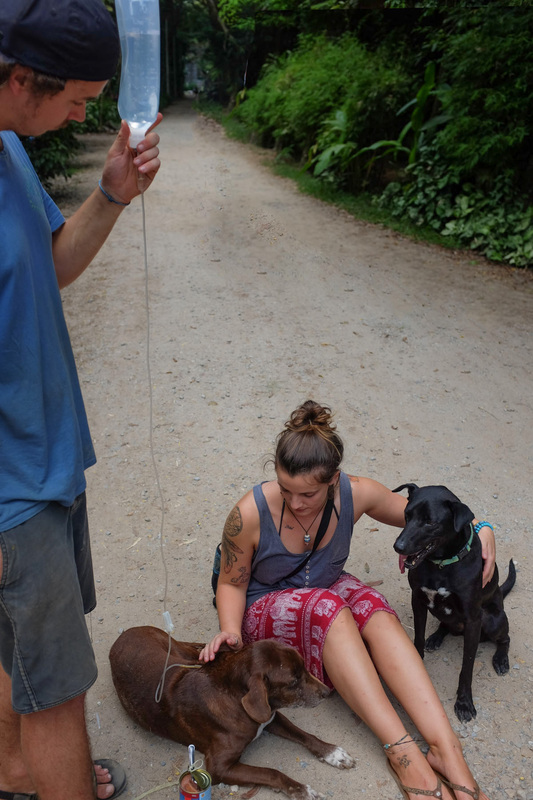 Among their duties is giving one of the older dogs, Memphis, his daily fluids and meds. He's very tolerant—the hard part is actually finding him, as he roams free around the entire property. Baby Jackie, on the other hand, needs no meds, she just doesn't want to miss out on any attention. My next stop was at a very new sanctuary, further north toward the Myanmar border. There is a lot of construction going on, and a lot of plans, but the current situation is less than ideal for the animals. 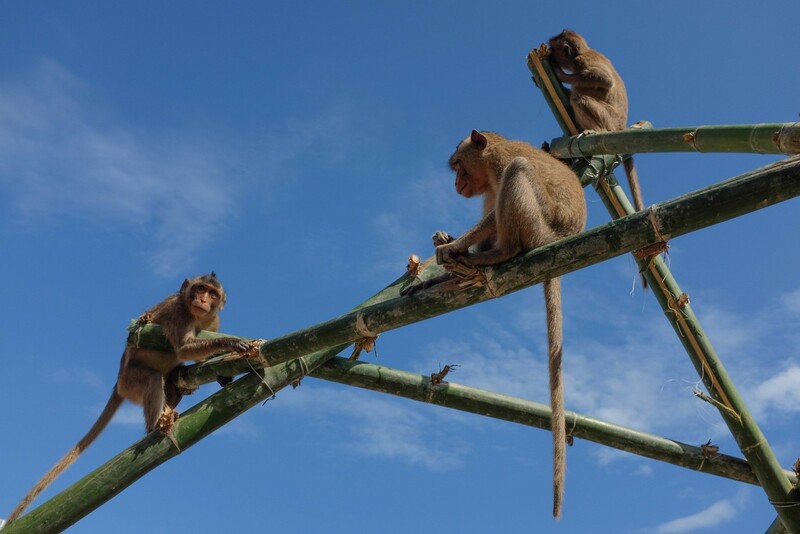 They have over 125 monkeys, and none of them have enough space. One of my main jobs was building "enrichments" for them, like the bamboo tower below. Having never built for monkeys before, I didn't anticipate that they would take my gesture as a challenge, to see how quickly they could completely destroy what I had built. But oh well, that's part of the fun, right? 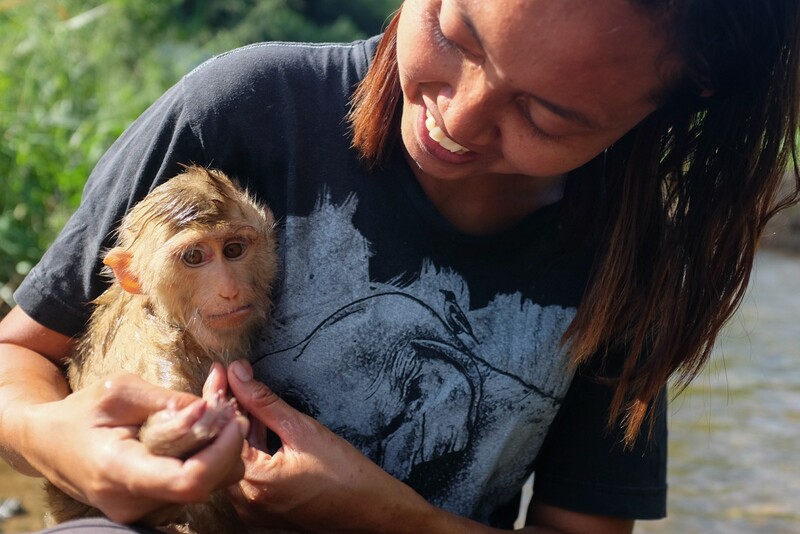 One of the monkeys, having been raised as a pet (which is never, ever a good idea), is pretty comfortable with humans. Ling Noi is less than a year old, kind of a drama queen, but super sweet. He would often ask me, through mimicry and pointing, to groom him (video). 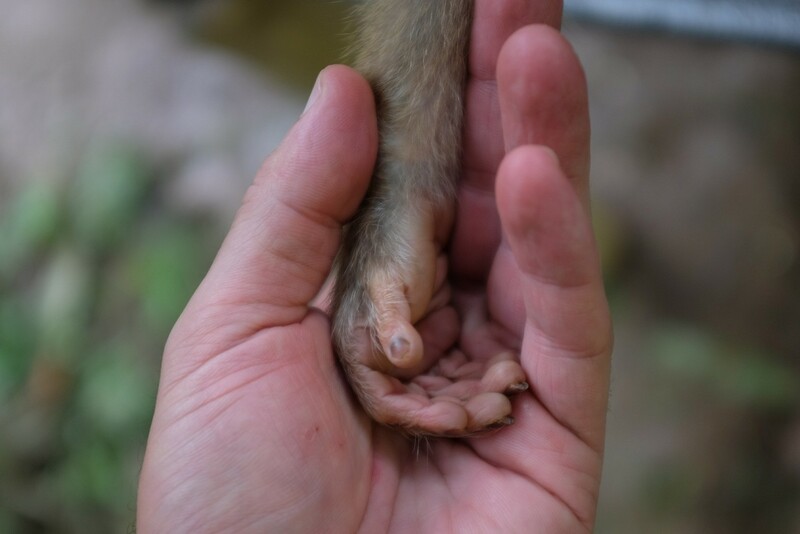 I'd never been this close to a monkey, and one of the most striking things was his hands. Not only was his behavior very human (or ours very monkey? ), but you can't ignore the similarity in their fingerprints and fingernails. 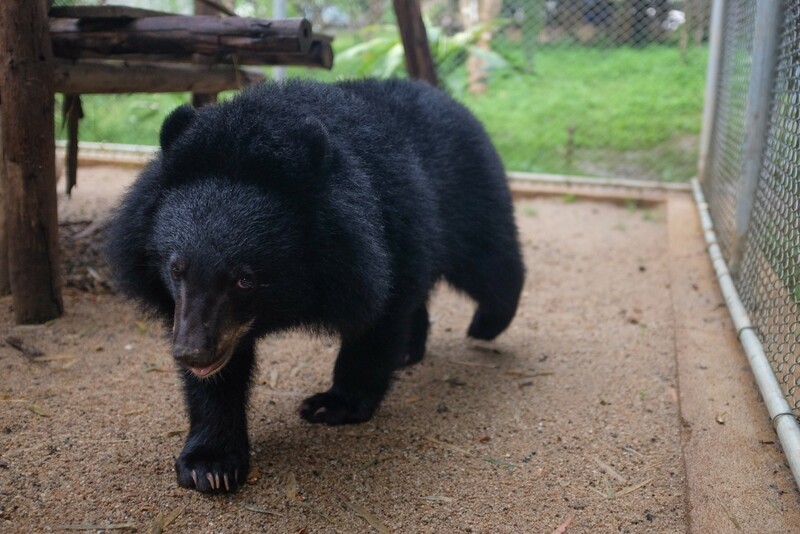 While Li Noi had the smallest enclosure (which I promptly expanded on my first day there), his comfort with humans means he gets to get out from time to time. One of the people who runs the place, Zah, is shown here bathing him in the river. While he's a big baby, and screamed like he was going to drown in the three inches of water, he clearly loves her and their little outings. 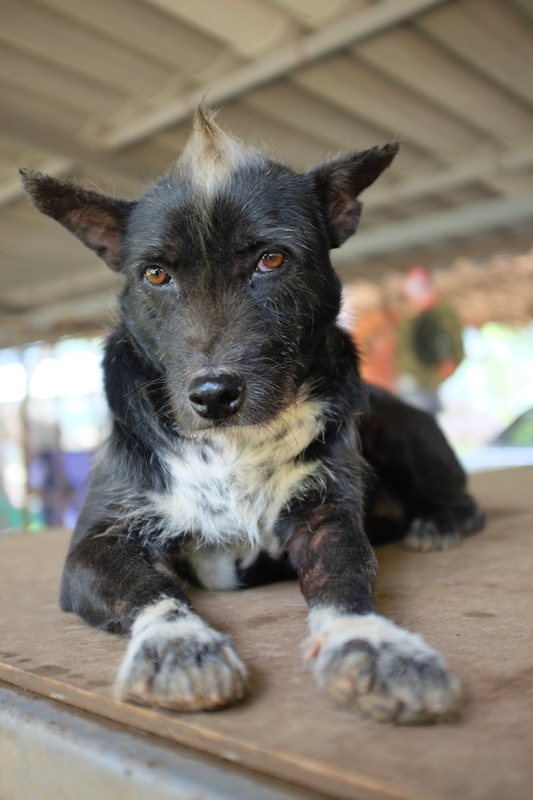 Working with rescued wild animals carries a layer of challenges you don't encounter with dogs, cats, cows, and chickens. 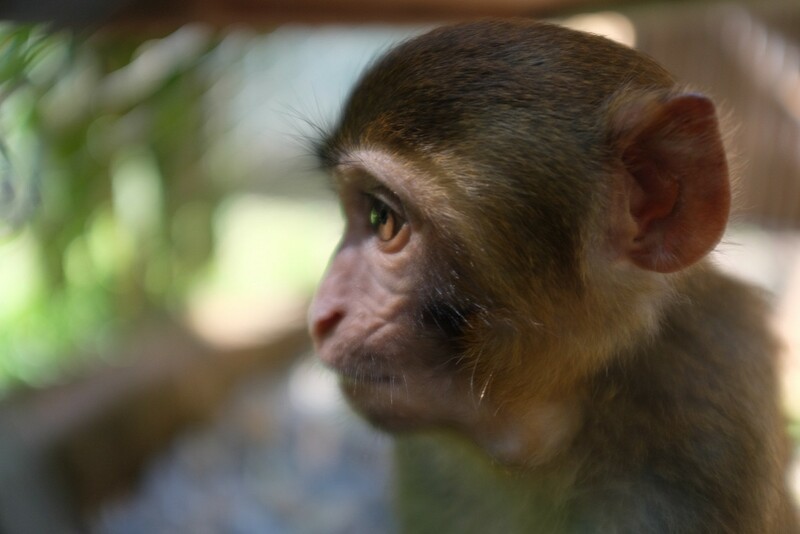 Every fiber of the monkeys' being longs for freedom. No matter how big their enclosure there is always a glimmer of the jungle in their eyes. Everything we do for their enrichment is in the hope that we can increase the number of brief moments when they forget about their captivity. But we do what we can, we remind ourselves how much worse the alternative is, and we work for wild release when possible. Two of the happiest animals there have to be Samson and Bubu, the moon bears. They would always like more space, but theirs is adequate for now. And more importantly they have each other. I could watch them wrestling all day long. Normally we'd feed them by hiding fruits and veggies all around their enclosure, so they can "forage" for them. But for variety, and the joy of interaction, sometimes they'd get hand-fed some watermelon. One of the ways my heart broke when leaving this magical place is having to part ways with baby bear! Little Taz was only nine months old, and only about three intimidating feet tall on her hind legs. Her mother was killed when she was a tiny baby, and she was brought here. She's very playful, but due to her extremely sharp claws and teeth I could only give her back scratches, and very careful belly rubs, through the gate. 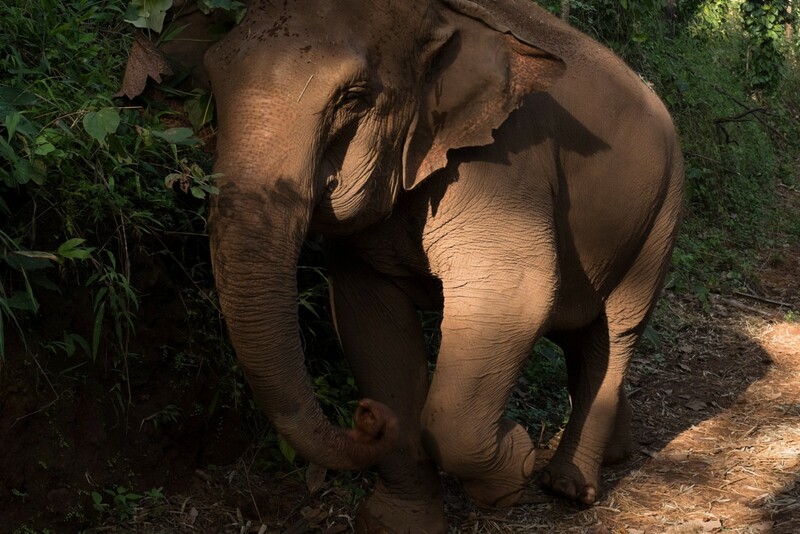 Back down south, there is another spot—thousands of acres of jungle, currently home to three more lucky elephants, and soon a few dozen rescued wild pigs. There is just nothing like watching these majestic beasts in their natural habitat, doing as they please. 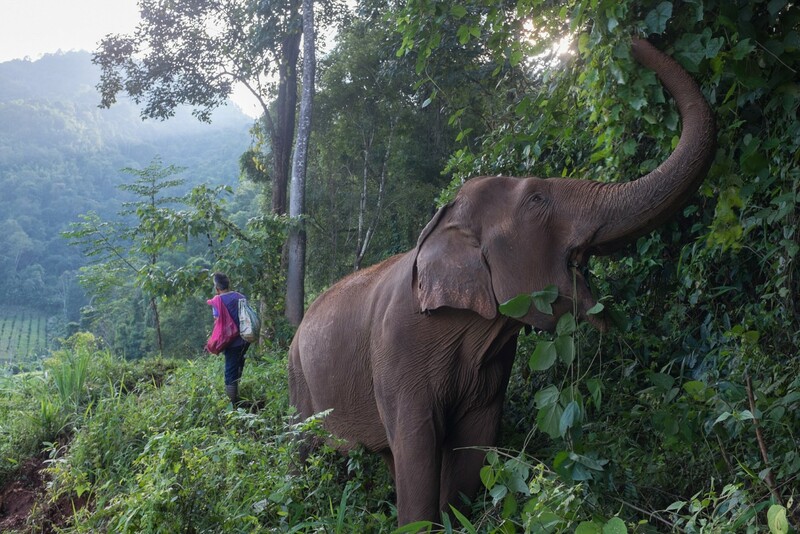 It was time to come back down the mountain, but this elephant decided, no, she wanted to find some yummy vines and bamboo to eat instead. And on the way back, she broke into the storage shed and stole a couple of pumpkins. They were waiting for her to eat anyway, so she got nothing more than a stern talking to—and got to keep the pumpkins of course. 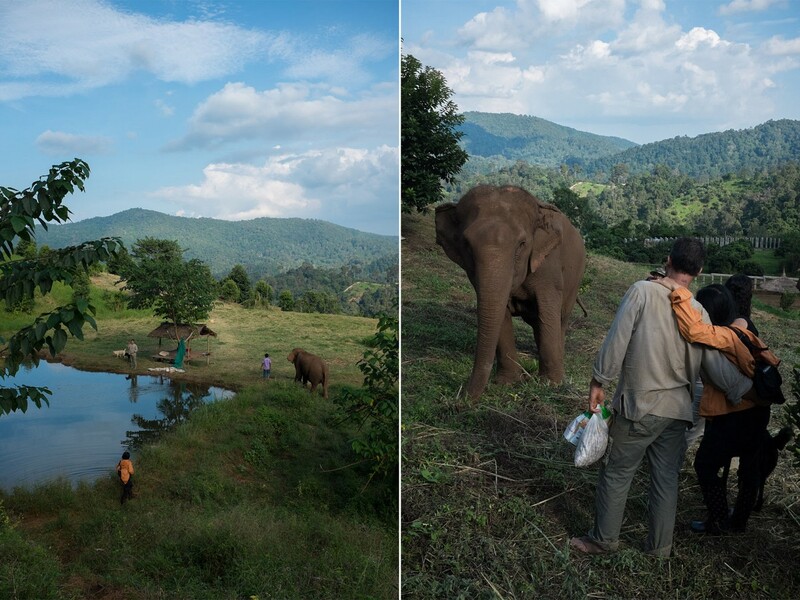 All of these sanctuaries were started by one, small Thai woman named Lek (which actually means small). She is an absolute inspiration of a human being. I had the honor of spending some time with her, and while many people of "celebrity" status may disappoint in real life, her kindness, humility, and work ethic were absolutely refreshing. It was also incredible to see the relationship she had with all the animals. 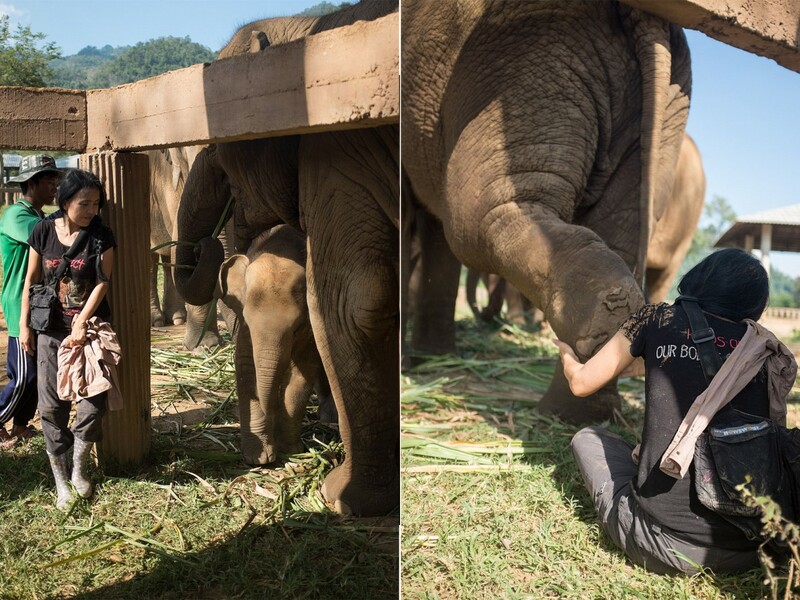 She is pictured below playing a bit of hide-and-seek with Dok Rak, and being offered the foot of another young elephant for inspection. She spends every minute of every day with the animals, or working for the animals. The other force behind the sanctuaries, for the last decade at least, is Lek's husband Darrick. Equally as hard-working, he left a lot in Canada to be here, but clearly has everything he could ever want right here. He also has a remarkable relationship with the animals. Kam La, a 6 year-old at the park has taken a particular liking to him. Their mutual trust and love is abundantly evident. But behind their success, of course, is a story. I had the great fortune to talk to Lek and Darrick more in depth on a ride back to the city. 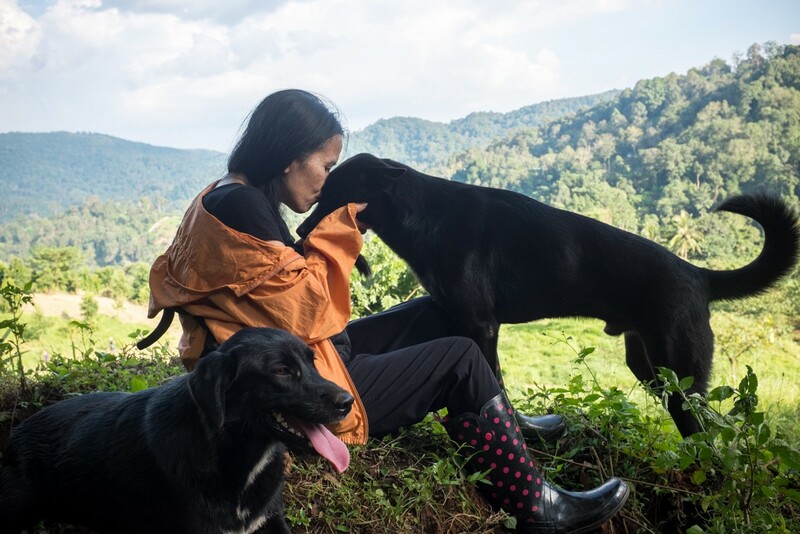 Lek told me, with a pup wrapped in a blanket on her lap, of how her relationship with animals became what it is. It started when Lek, at age 11, saw a water buffalo being slaughtered. This was in the 1970s, in rural Thailand. There was nothing hidden from sight, and no pretense of "humane animal husbandry." Witnessing this buffalo, stabbed, slashed, and bled to death before her eyes, she decided then and there never to eat animals again. The very next year, with her reputation for liking animals, she was tasked with caring for 12 pigs. She hand raised them, giving them food, attention, a clean and comfortable home, and love. At school she would be relentlessly teased by the other kids, as the "jungle girl." Testing her toughness, they would step on her bare feet with their shoes. They would sexually harass her—even the teacher's son, and they would get away with it. And she would come home to her 12 pigs, weeping to them as they licked her tears, and rested their heads on her shoulders. She spoke to them of her struggle, and they would listen. At night she would sit with them and read fairytales. They would gather around, and fall asleep at her side, her legs their pillow. But one day she came home to screams. To her horror she found her pigs being tied by the feet and mouth and loaded onto a truck. She pleaded with the man to leave them be, but he laughed, said they didn't belong to her, and spit at her. While the man was impressed by her ability to instantly put the pigs at ease, even in their terrifying last moments, they were all torn from her life. Her only friends in the world were loaded onto a truck, and driven away to be killed and eaten. More than 40 years later, she still tells this story with tears in her eyes. At this point I ask her the question that has been weighing on me for months, "how do you deal with hopelessness?" But she responds in resolute defiance, "No, Lucas, we can never lose hope! Not for a moment, we have to stay strong!" We, as she said, can speak, we can type, we can be a voice for the animals who cannot fight for themselves. And so we must, and that is all there is to it. Darrick had a different take. 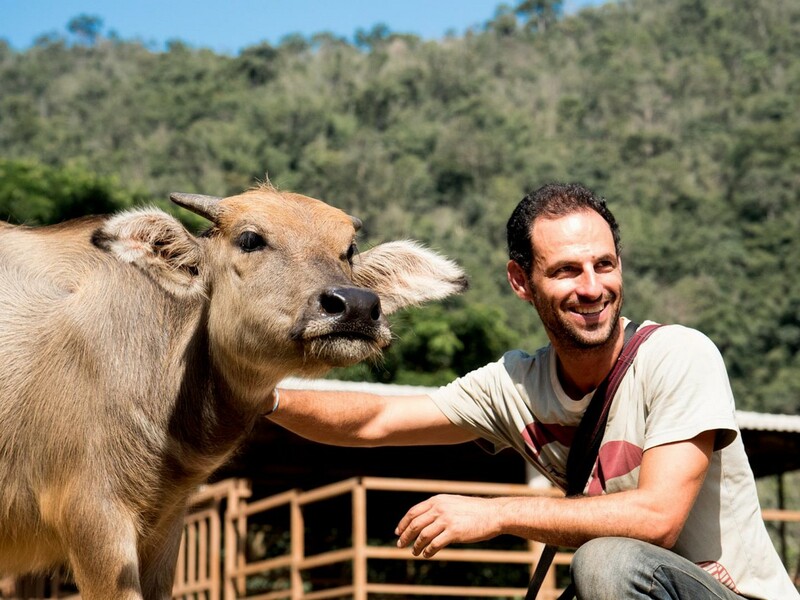 He went vegan back in the 1980s, after seeing a butcher brutally killing a cow in Toronto. After witnessing this grisly and bloody scene, he said to himself "there's no way I could ever do that. And so there's no way I'm paying someone else to do it for me." And that was that. Over the decades he's had plenty of opportunities to lose hope. But he said it seems that hopelessness is more of a risk for those who don't actually work with animals, for whom the commitment to ending suffering is more abstract. At this point it all started coming together for me. What empathy gives us—the gift of love and the burden of heartbreak, must both be at the core of our passion. They cannot fight each other. I see them, I watch as their elephant friends come running across the field to greet them. I see their massive foundation—at least half a dozen sanctuaries and growing—and I think well, sure, for them the love and success outweighs the pain and heartbreak. But no, I think it's that we must—out of moral imperative, embrace both the love, wonder, and success, and the heartbreak, despair, and failure. We must embrace all these consequences of empathy, and harness their power to keep fighting. For if we give in to hopelessness, if we quit, step back, avert our eyes and stand idle, then the animals continue to suffer, and our hopelessness grows upon itself. We end up retreating from it all, bitter, guarded, and passive. But I've seen the alternative in them: successful, inspirational, and surrounded by a herd of animals who love them endlessly. Their hearts have certainly broken and healed thousands of times over, but I don't think they'd trade any second of their lives for the world. 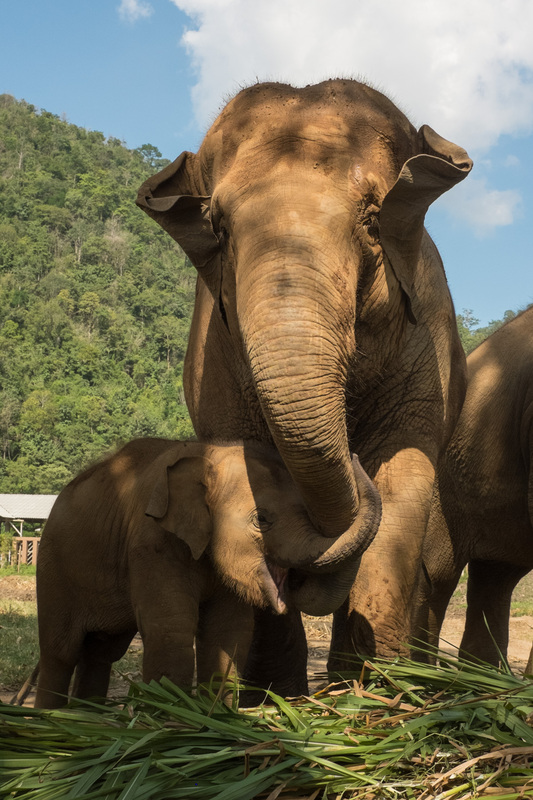 Check out the Save Elephant Foundation website, or their Facebook page, and if you're ever in Thailand or Cambodia I can't recommend a visit strongly enough!